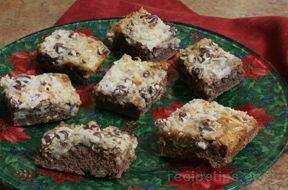 These bars are an easy-to-make copy-cat version of the coconut-caramel-chocolate-shortbread Girl Scout cookie. Now you can make these year round rather than wait for the knock on the door. Preheat oven to 350Â°F. For the cookie base: Line a 9x13 inch baking pan with aluminum foil and spray it lightly with cooking spray. In a large bowl, cream together sugar and butter until fluffy. Working at a low speed, gradually beat in flour and salt until mixture is crumbly, like wet sand. Bake for 20-25 minutes, until base is set and edges are lightly browned. Cool completely on a wire rack. For the topping, unwrap the caramels and place in a large microwave-safe bowl with milk and salt. Microwave on high for 3-4 minutes, stopping to stir a few times to help the caramel melt. Put spoonfuls of the topping all over the shortbread base. Using a spatula, spread the topping in an even layer. Let topping set until cooled. 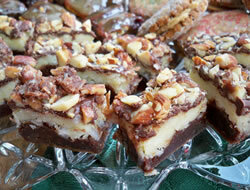 When cooled, cut into 30 bars with a large knife or a pizza cutter. Once bars are cut, melt chocolate in a small bowl. Heat it on high in the microwave in 45-second intervals, stirring thoroughly to prevent scorching. 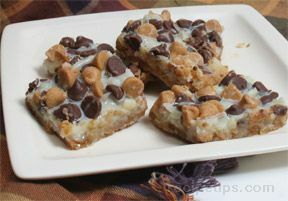 Dip the base of each bar into the chocolate and place on a clean piece of wax paper. 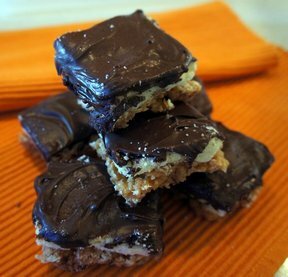 If desired, use remaining chocolate to drizzle bars with chocolate to finish. "These are good. The coconut layer didn't want to stick to the shortbread, but once you got it all together it really did taste like the Girl Scout cookie Samoas."